Thyroglobulin - A glycoprotein of molecular weight 660 Kilodaltons produced by the follicular cells and containing the precursors of T3 and T4. The thyroid gland secretes two iodine-containing hormones, thyroxine (T4) and triiodothyronine (T3). T4 is produced in a greater amount and is converted in peripheral tissues to T3, the more active hormone. The synthesis and secretion of the thyroid hormones is stimulated by thyroid-stimulating hormone (TSH), which is secreted by the anterior pituitary gland. The release of TSH is stimulated by the hypothalamic hormone, thyrotropin releasing hormone (TRH). T4 and T3 exert a negative feedback effect on the anterior pituitary and hypothalamus, and thus regulate TSH and TRH release, respectively. Since TSH is a good index of thyroid function it is recommended as the primary screening test. A fall in thyroid hormone levels causes an increase in the size and number of the thyroidal follicular cells, an increase in TRH and TSH secretion, and thus increased thyroid hormone synthesis and release. 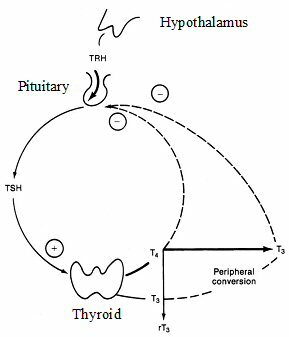 An increase in thyroid hormones increases degradation of TRH, decreases the number of TRH receptors on pituitary cells, and inhibits pituitary response to TRH. The result is decreased synthesis and secretion of TSH until normal T3 and T4 levels are reached. In the peripheral blood T4 and T3 are reversibly, and almost completely, bound to carrier proteins. T4 is bound 75% to the alpha-1 globulin known as thyroxine-binding globulin (TBG), 15% to prealbumin, and 10% to albumin; 99.97% of all T4 is bound, and only 0.03% is in the free form. T3 binds only to TBG (99.7%), while 0.3% is in the free form. Table 1 is a list of serum tests used in the diagnosis of thyroid disease. Hyperthyroidism: TSH, free T4, total T3, free T3, antithyroid antibodies, thyroid peroxidase antibodies, TSH-receptor antibody, thyroid-stimulating immunoglobulin (TSI), cholesterol. Familial dysalbuminemic hyperthyroxinemia in which an abnormal albumin preferentially binds T4 but not T3 and is characterized by elevations of total serum thyroxine. Case finding of hyper- or hypothyroidism in the general population: TSH with follow-up with free T4 or free T3, respectively. Abnormalities in thyroid function tests in euthyroid patients are most likely found in non-thyroid illness and the elderly. Thus, thyroid function tests should not be requested in elderly or hospitalized patients unless the present complaint suggests a thyroid problem. See Figure 4. The syndrome is seen in a variety of patients with non-thyroid illnesses, after acute injury, during caloric deprivation (especially carbohydrates), and in some psychiatric illnesses, e.g., schizophrenia. In these conditions, thyroid function test results may be different from normal, with the patient still being euthyroid. In most cases, the conversion of T4 in the peripheral tissues is not yielding T3, but reverse T3 (rT3). Therefore, a combination of low T3 and high rT3 is generally seen in this syndrome. Total T4 drops later in the disease to a variable degree. FT4 and FT3 may remain normal, but often they increase in the early part of the disease, and decrease later in the disease. No laboratory test is absolutely reliable in this condition, but the best test appears to be TSH. The incidence of the disease is higher than initially thought and may be as high as 50% in patients in the intensive care unit. Total T4 is usually quantitated in serum by immunoassay. These assays offer the advantages of simplicity, speed, accuracy and precision. Since free T4 is not always available, one should understand the use of total T4. The reference range of total T4 has been established as 4.5 - 10.5 μg/dL in serum. Values lower than 4.5 μg/dL are indicative but not diagnostic of hypothyroidism. Workup should include a TSH, and free T4. Values higher than 10.5 μg/dL are indicative but not diagnostic of hyperthyroidism. Workup should include TSH, and free T4. A finding of normal results does not absolutely exclude hyperthyroidism because elevations in T4 may be intermittent and/or hyperthyroidism may be due to an increase of total T3, which increases at times sooner than total T4. The quantitative measurement of T3 in serum is primarily used to confirm hyperthyroidism and T3 thyrotoxicosis. Since free T3 is not yet widely available in the U.S., one should understand the use of total T3. T4 and T3 are present in plasma in two forms: bound to plasma proteins and free. T3 is essentially bound only to TBG; however, T4 is also bound to prealbumin and albumin. The high affinities that govern these reactions result in the formation of 99.97% T4 bound and only 0.03% free T4; and 99.7% T3 bound, and 0.3% free T3. As stated above, T3 binds significantly only to TBG, while T4 is distributed between the α1-globulin TBG (75%), prealbumin (15%), and albumin (10%). Factors affecting binding proteins are shown in Table 2. * These agents affect binding capacity by displacing hormone from the proteins. In clinical practice, the most frequently encountered findings are due to pregnancy or oral contraception. It is well established that the thyroid state of the patient correlates better with the plasma concentrations of the free forms of T4 and T3 than with the levels of total hormone concentrations. Thus, a most important measurement in the assessment of thyroid status is an estimation of free T4 and free T3. The direct accurate measurement by dialysis or ultrafiltration of the free T4 and free T3 is the “gold standard” measurement but the procedure is difficult and time consuming, and thus impractical for routine use. For these reasons, simpler methods have been developed that estimate the free hormone levels by indirect means. The most commonly used procedure is the two-step fluorometric enzyme immunoassay for free T4. The most reliable procedure is the dialysis technique. The adult reference range is 0.9 – 2.1 ng/dL. Free T3 is widely used in Europe and may soon be more available in the US. The adult reference range is 0.1 – 0.3 ng/dL. Thyrotropin is a glycoprotein of a MW 28,000. It is composed of two noncovalently-linked subunits termed α and β. The α-subunit of TSH is identical to the α-subunits found in FSH, LH and hCG, whereas the β-subunits in these peptide hormones are distinctly different and account for their biological and immunological differences. The quantitative ultrasensitive immunometric TSH determination in serum is the most useful test to detect hypo- and hyperthyroidism. 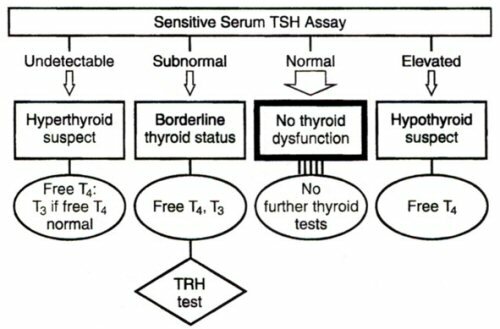 Additionally, serum TSH is a very useful test in distinguishing primary (thyroidal) and secondary (pituitary) hypothyroidism. TSH is elevated in primary hypothyroidism when there is a defect in thyroid hormone production, whereas in secondary hypothyroidism serum TSH levels are low due to pituitary failure. The adult reference range is 0.35 – 5.5 mU/L. 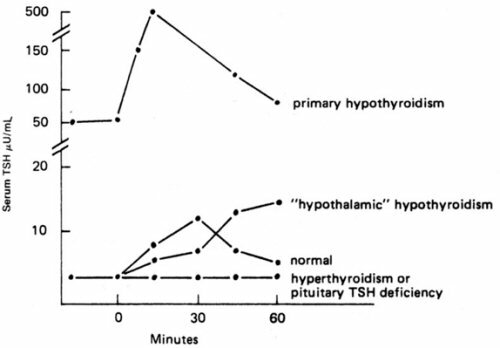 A TRH- (thyrotropin-releasing hormone) TSH stimulating test is useful for determining pituitary function since administration of TRH will normally increase plasma levels of TSH within 30 minutes after administration, whereas no increase in plasma TSH is observed in pituitary hypothyroidism. A flat response to TRH is observed in hyperthyroidism and presumed subclinical hyperthyroidism (also seen in pituitary TSH deficiency). Tertiary (hypothalamic) hypothyroidism results from deficient hypothalamic synthesis of TRH. Since there is no available reliable assay for serum TRH, hypothalamic malfunction can be inferred from a TRH stimulation test. See Figure 3. High titers of anti-thyroglobulin and anti-microsomal antibodies are found in autoimmune diseases such as chronic lymphocytic (Hashimoto’s) thyroiditis (hypothyroid cases) and lymphadenoid goiter (euthyroid cases). Recent evidence indicates that sera with antimicrosomal autoantibodies from patients with Grave’s disease or Hashimoto’s thyroiditis bind to thyroid peroxidase, suggesting that thyroid peroxidase is the microsomal antigen in these diseases. IgG human thyroid stimulators are present in nearly all cases of Graves' disease when the assay is performed with human thyroid cells or cell membranes. Thus, it appears that a human thyroid stimulator immunoglobulin is the mediator for the expression of Graves' disease and that this antibody mimics the action of TSH by combining with the TSH-receptor sites of the thyroid cells. However, TSI does not respond to the feedback mechanism and thus continuously stimulates secretion of thyroid hormones. Reverse T3, 3, 5, 5'-triiodothyronine (rT3), is an inactive metabolite of T4 that may be increased in acute febrile illnesses, chronic hepatic cirrhosis, and other miscellaneous chronic systemic illnesses, and particularly in newborns. 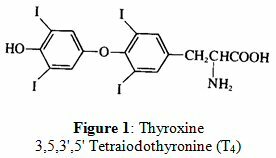 In these patients, low T3 concentrations are found, (although they are euthyroid) because T4 is deiodinated to rT3 rather than T3 and it may be useful to confirm this by an rT3 assay. rT3 measurements in amniotic fluid have been proposed as a test for assessing fetal thyroid function because rT3 is the major metabolite of T4 in the fetus. The serum reference ranges for rT3 in adults and children are 30 - 80 and 20 - 70 ng/dL, respectively. Thyroid tissue is the sole source of thyroglobulin (MW = 660,000) in peripheral blood. Patients with thyroid cancer who have been thyroidectomized should have no circulating thyroglobulin, and increases in this iodoprotein are generally indicative of tumor recurrence. Congenital hypothyroidism occurs in one out of every 4,000 newborn infants. Early detection of neonatal hypothyroidism is important since mental retardation that results from this disease can be prevented by prompt thyroid hormone treatment. Therefore, a sensitive RIA for T4 using a 3 mm spot (equal to 3 μL) of whole dried blood on filter paper has been developed to detect hypothyroidism in 3-5 day old infants. If the plasma T4 concentration is below 7 μg/dL, a follow-up TSH, that utilizes the whole dried blood sample on filter paper, is performed to establish a definitive diagnosis of primary hypothyroidism. Blood is collected from neonates by heel puncture. Blood spots on filter paper can be sent by mail, and portions of the same spots can be utilized for the phenylketonuria screening test. In neonates, thyroid hormone levels and TBG are higher than in adults. The prevalence of thyroid disease in the general population is estimated to be 1-2%. Thus, thyroid disease constitutes one of the most frequent diseases that is amenable to treatment. For this reason, screening for thyroid disease appears advisable and is best done by including a TSH and FT4 determination in biochemical panels to examine well populations and patients that seek medical attention for reasons other than their thyroid status. Remember the complications in interpretation of thyroid tests caused by non-thyroidal illness and advanced age. The combination of an undetectable TSH (<0.1 mU/L) and normal serum T3 and fT4 (usually at the upper end of the reference range) is known as subclinical hyperthyroidism. An absence of symptoms was once part of the definition but we now understand that subtle symptoms or signs of thryotoxicosis may be present. The prevalence of subclinical hyperthyroidism is about 2%. The health consequences of overt hyperthyroidism are well known to include atrial fibrillation and osteoporosis. While the effects are much less evident in subclinical hyperthyroidism it does bear some discussion. Subclinical hyperthyroid patients have a relative risk of 3 for atrial fibrillation as compared to those patients with normal TSH; however, a low but detectable TSH of 0.1 to 0.4 mU/L did not have an increased risk of atrial fibrillation. The case is not as clear for osteoporosis. Subclinical hyperthyroid patients that have endogenous sources of thyroid hormones appear to have increased bone turnover. Most impressive is the reported loss of 2% bone mineral density per year in postmenopausal women with multinodular goiter. On the other hand, patients with exogenous sources of excess thyroid hormone the risk factor is inconclusive. The 2004 expert panel on thyroid disease recommends observing and monitoring patients with partial TSH suppression (0.1 to 0.4 mU/L) but to treat patients with complete TSH suppression (<0.1 mU/L). Subclinical hypothyroidism is defined as elevated TSH associated with normal concentration of T3 and fT4. The overall prevalence is 5-10% in the general population and up to 20% in women over 60 years old. While the consensus panel recommends treatment of patients with TSH >10 mU/L, there is some controversy with the treatment of patients with TSH of 4.5 to 10 mU/L. The key determinate is the clinical judgment of the health care provider. Thyroid failure can be considered a continuum with patients having TSH of 4.5 to 10 mU/L being on one end of the spectrum and those with myxedema coma on the other end. Milder disease would be related to lesser adverse effects; however, the intervention must be also evaluated for potential harm. About 20% of patients receiving levothryoxine are overtreated. This should not argue against treatment - instead it is an important statement endorsing laboratory monitoring to insure that the resulting thyroid hormone treatment is reflected in an appropriate TSH. Treatment should not be a reflexive action based on a solitary TSH measurement but should be considered in the overall clinical situation. It is important to ensure that abnormal TSH values are not a transient adjustment in progress due to other treatments or responses to illness. A 27-year-old, non-pregnant woman has a serum T4 of 13.5 μg/dL and a serum T3 of 280 ng/dL. Her serum TSH, cholesterol, and CK were all normal, and her physical examination was within normal limits. What other thyroid function tests should be obtained to confirm your conclusion? A 59-year-old woman complaining of numbness and paresthesia of her right index and ring fingers had gained about 30 pounds the previous year. She exhibited a tired look with slight periorbital puffiness and a diffusely enlarged thyroid (1.5 times normal size). For the last six months she had noted dry skin, decreased energy and a change in her voice. Her heart sounds were decreased, but there was no cardiac enlargement. Her heart rate was 56 beats per minute, and blood pressure was 130/90 mmHg. The remainder of her physical exam was unremarkable except that the relaxation phase of her deep tendon reflexes was delayed. List other etiologies for hypothyroidism. A slightly anxious 49-year-old woman with bright eyes, but no exophthalmos, presented with a slight tremor and a diffusely enlarged thyroid gland. Her serum T4 was 19.8 μg/dL, free T4 4.2 ng/dL and T3 660 ng/dL. The serum was positive for antimicrosomal and antithyroglobulin antibodies. Would it be useful to obtain serum TSH levels? What additional test might be helpful? A 55-year-old man complained of nervousness and fatigue which had been apparent for 3 months. He had lost 10 pounds despite a voracious appetite. Recently, he had been bothered by palpitations and shortness of breath. All of his symptoms seemed heightened by the summer heat which caused him to perspire excessively. About a month ago, he noted redness and tearing of both eyes. On examination, he is a thin, anxious appearing man, 68 inches in height, whose weight is 155 lb. Pulse is 110 BPM and blood pressure is 140/70 mmHg. There is bilateral proptosis, periorbital edema, and marked conjunctival congestion. He is unable to move his eyes completely into the superior-temporal position. Visual acuity and fundoscopic exam are otherwise normal. The thyroid gland is moderately firm and symmetrically enlarged to an estimated 50 g (normal, 15-20 g) without any palpable nodules. A systolic bruit and lateral venous hum are heard over the gland. The skin is warm and smooth, and several areas of vitiligo are prominent on his hands and feet. Hair is of fine texture. Reflexes are brisk, and there is a fine tremor of the outstretched hands. The 24 hour radioactive iodine uptake is 68% (5-28%). Thyroid scan shows enlargement with a diffuse uptake. The patient is treated with propylthiouracil (PTU). After 3 weeks of therapy, the patient complains of a sore throat. CBC reveals a diminished white count. PTU is discontinued and alternate therapies are considered. Based on the history and physical, what is your initial clinical impression? What are some possible causes of this disorder? What screening tests support your initial clinical impression? What is the significance of the positive TSI and abnormal radioiodine uptake? What is the pathogenesis (and morphology) of this patient’s disease? What therapies are available to manage this patient? What is “thyroid storm”? How is it treated? Why are Ca, P, and alkaline phosphatase increased? Well, Bryan that treatment (www.naturalvitiligotreatmentsystems.com) is working for me! My white patches are disappearing and i only have 2 weeks of treatment. Thanks a lot for the advice!!!! How do I prevent vitiligo in? Do you hava a questions bank for all topics here ? ?